Annie McDee, thirty-one, lives in a shabby London flat, works as a chef, and is struggling to get by. Reeling from a sudden breakup, she’s taken on an unsuitable new lover and finds herself rummaging through a secondhand shop to buy him a birthday gift. A dusty, anonymous old painting catches her eye. After spending her meager savings on the artwork, Annie prepares an exquisite birthday dinner for two—only to be stood up. The painting becomes hers, and Annie begins to suspect that it may be more valuable than she’d thought. Soon she finds herself pursued by parties who would do anything to possess her picture: an exiled Russian oligarch, an avaricious sheikha, an unscrupulous art dealer. In her search for the painting’s identity, Annie will unwittingly discover some of the darkest secrets of European history—and the possibility of falling in love again. 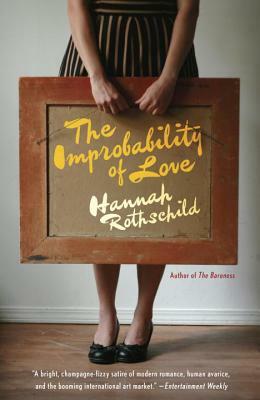 Hannah Rothschild is the author of The Baroness: The Search for Nica, the Rebellious Rothschild. She is also a film director whose documentaries have appeared at such festivals as Telluride and Tribeca. She has written for British Vanity Fair, Vogue, The Independent, and The Spectator, and is vice president of the Hay Literary Festival, a trustee of the Tate Gallery, and the first woman chair of the National Gallery in London.